A panoramic view from a ridge between Segla and Hesten mountain summits on Senja island, with Øyfjorden to the left and Mefjorden to the right, in Troms county, Northern Norway. A virtual guide to Norway, one of the Scandinavian kingdoms. The country is situated in Northern Europe, the western portion of the Scandinavian Peninsula, with coastlines at the North Sea and the North Atlantic Ocean. It is bordered by Sweden, Finland, and Russia and it shares maritime borders with the United Kingdom, Iceland, and Denmark. Norway's landscape offers rocky wilderness with mountains and glaciers and its coast is dented by coastal fjords, long, narrow inlets with steep cliffs, some of the fjords reach deep into the interior of the country. Norway's mainland covers an area of 323,802 km², making it somewhat smaller than Germany, or slightly larger than the US state of New Mexico. Just 5.2 million people live in this sparsely populated country, most of Norway's population is concentrated in the southern portion of the country. Capital and largest city is Oslo, spoken language is Norwegian, a North Germanic language. The Viking period (9th to 11th centuries) was one of national unification and expansion. The Norwegian royal line died out in 1387, and the country entered a period of union with Denmark. By 1586, Norway had become part of the Danish Kingdom. 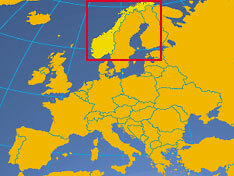 In 1814, as a result of the Napoleonic wars, Norway was separated from Denmark and combined with Sweden. The union persisted until 1905, when Sweden recognized Norwegian independence. The Norwegian Government offered the throne of Norway to Danish Prince Carl in 1905. After a plebiscite approving the establishment of a monarchy, the parliament unanimously elected him king. He took the name of Haakon VII, after the kings of independent Norway. Norway was one of the signers of the North Atlantic Treaty in 1949 and was a founding member of the United Nations. The first UN General Secretary, Trygve Lie, was a Norwegian. Under the terms of the will of Alfred Nobel, the Storting (Parliament) elects the five members of the Norwegian Nobel Committee who award the Nobel Peace Prize to champions of peace. Discovery of oil and gas in adjacent waters in the late 1960s boosted Norway's economic fortunes. In a referendum held in 1972 and 1994, Norway's people rejected joining the EU. Bergen (236 000), Trondheim (153 000), Stavanger (111 000), Bærum (102 000). Ethnic Groups: Norwegian, Sami 20 000; foreign nationals (315 000) from Nordic and other countries. Religions: Evangelical Lutheran, 86%; other Christian, 4%; Muslim. Agriculture products: Barley, wheat, potatoes; pork, beef, veal, milk; fish. Industries: Petroleum and gas, food processing, shipbuilding, pulp and paper products, metals, chemicals, timber, mining, textiles, fishing. Parliament of Norway, the building houses the Stortinget (lit. "the great thing"), the country's unicameral parliament is the supreme legislature of Norway. Norway is considered to be one of the most developed democracies and states of justice in the world. The country has a hereditary constitutional monarchy with a parliamentary democratic system of governance. Head of State is the monarch. Executive power is exercised by the King's council and the cabinet, which is headed by the Prime Minister, the executive power is dependent on the direct or indirect support of the legislature, Norway's parliament (Stortinget). The Royal Family of Norway. Government Administration Services, Norway's official government information portal. Ministry of Foreign Affairs, Norway. Established in 1959 in order to promote a better understanding of international issues in Norway. Site of the Permanent Mission of Norway to the UN. The Royal Norwegian Embassy, Washington, D.C.
Norway is not a member state of the EU, but maintains close relations to the European Union. Norwegian Diplomatic Missions around the World. Statistics Norway, Norway in figures. Searchable map and satellite view of Norway. Searchable map and satellite view of Norway's capital city. Political Map of the Baltic Sea Area. Norway's largest newspaper with national and international news (in Norwegian and English). Norway's second largest tabloid newspaper. Norwegian online news in English. Norwegian online portal with news in Norwegian. All about Ibsen, the author of Peer Gynt. Culture Net Norway, a gateway to Norwegian culture (in Norwegian). Norwegian visual art from the 1830s up until today. The Edvard Munch Museum in Oslo. Part of Kulturnett Norge, offers information about more than 800 Norwegian museums. Norway's largest collection of art, architecture and design. Best source to know more about the mythical world of the Norse pantheon. Thor Heyerdahl and the Kon-Tiki Museum Institute for Pacific Research and Cultural history. The Northern Lights Planetarium, Norway's foremost planetarium, Tromsø. The Norwegian Company of Contemporary Dance. Official site of the Norwegian National Opera. 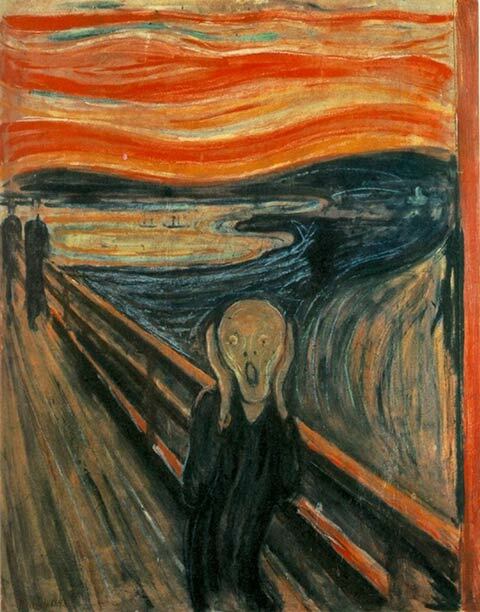 One of the four versions of 'The Scream', one of the most famous pictures by Norwegian painter Edvard Munch. Europe's second most efficient airport in 2008. The world's most beautiful voyage - all along the Norwegian coast. 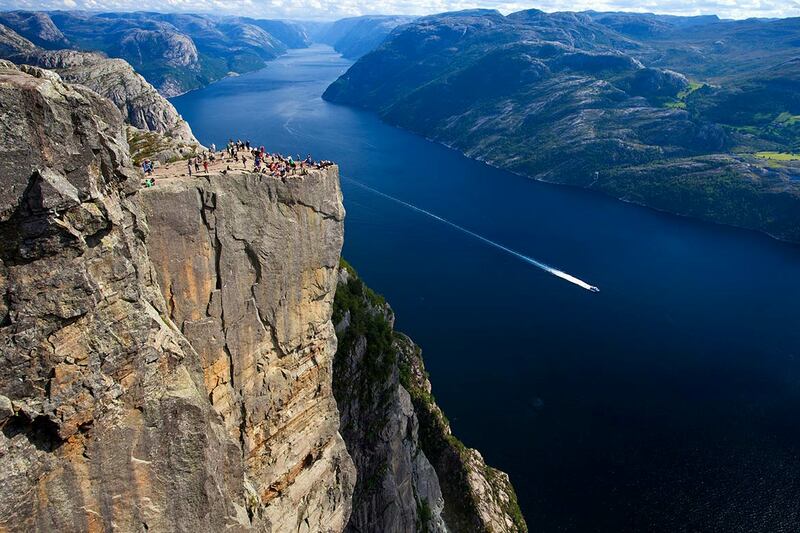 Preikestolen cliff or Pulpit Rock rises 600 m above the Lysefjord, it is one of the most visited natural tourist attractions in Norway. Official travel guide to Norway, a unique and exotic destination. Tourist guide to Northern Norway. Touristinformation on Helgland part of Nordland county and the most southerly district in Northern Norway. The official website for Oslo. The city of Bergen, the Gateway to the Fjords. To celebrate the millennium, the city of Sortland, is being painted blue. The worlds northern most ice hotel, reindeer inclusive. Homepage of the Sami Nation. A research university with specialization in technology and the natural sciences, campuses are located in Trondheim, Gjøvik and Ålesund. University of Bergen is a public university located in the city of Bergen. Norway's largest and oldest university, founded in 1811. The Arctic University of Norway is the world's northernmost university, founded in 1968. All about study in Norway. 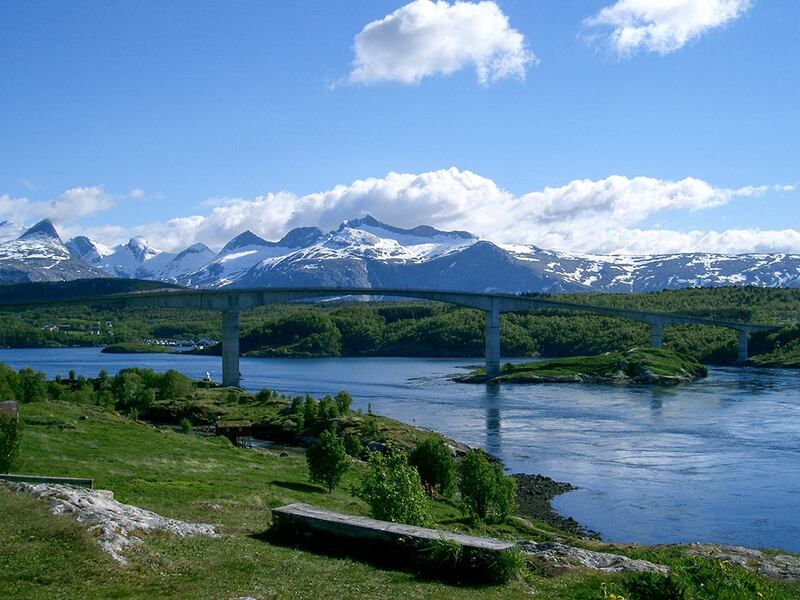 Saltstraumen Bridge in Salten, a district in Nordland county, the narrow channel beneath the bridge is Saltstraumen, a small strait with one of the strongest tidal currents in the world. Vortices known as whirlpools or maelstroms up to 10 metres (33 ft) in diameter and 5 metres (16 ft) in depth can be formed. Official website of the ministry with information about Norway's environmental policy. Fjords, mountains, waterfalls and glaciers. Marine resources, marine environment, and aquaculture. Norway's central institution for research, environmental monitoring and mapping of the polar regions. Provided by the Royal Norwegian Embassy in London. Comprehensive Wikipedia article about Norway's history. Learn more about the mythical world of the Norse pantheon. 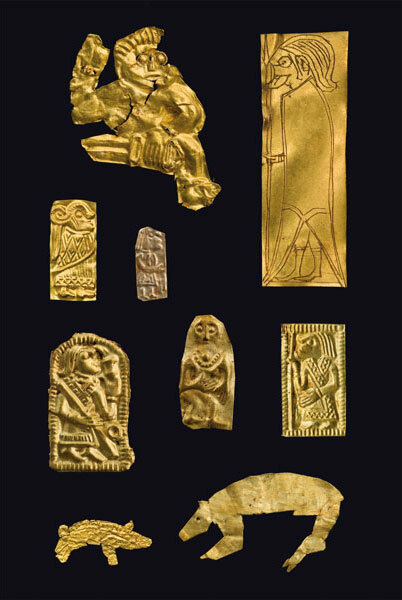 Goldgubber, golden amulets or offerings from the late Iron Age, found only in Scandinavia.